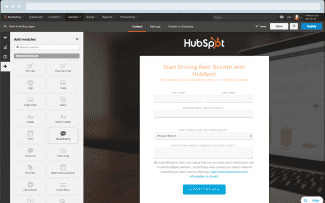 HubSpot offers Marketing and Sales applications and a free CRM. The advantage of using versions of these platforms together is a sophisticated online ecosystem with seamlessly shared data and organizational tools. HubSpot is well-known for its inbound marketing tools and offers users a high degree of customization and analysis over individual marketing assets, allowing for a fine-tuned approach to content marketing, email marketing and website design. HubSpot offers three main plans for its Marketing solution. 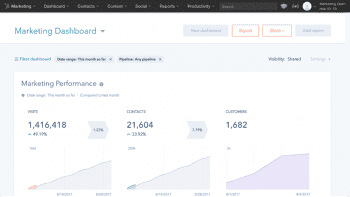 It also offers two budget plans – HubSpot Free and HubSpot Starter – with limited features for users and businesses to gain a sense of what the platform can accomplish. Those plans can be viewed here. HubSpot Marketing plans offer considerable tools for generating, nurturing and qualifying leads, particularly through inbound marketing, such as social media content, ad campaigns, and email marketing. It also offers powerful customization and analytics for individual marketing assets – calls to action, landing pages, email templates, email campaigns can be tracked, measured and compared in A/B tests. HubSpot pricing is also a bit more flexible than many of their marketing automation rivals – smaller businesses with fewer contacts can presumably receive advanced functions at lower rates, but the rates balance with HubSpot’s industry peers as contact needs level off. A major advantage to HubSpot Marketing is native integration with its Sales platform and its CRM. The features dovetail well and your data is stored on a common database – there’s no need for a paid add-on to align your Marketing and Sales platforms. HubSpot requires a paid onboarding session, which increases the upfront cost of its services but provides a crash course for new users to create campaigns and configure account settings, workflows and so forth. This lowers the barrier to entry for companies without a heavily vested marketing team, not to mention an IT department – HubSpot’s platform, like others, allows for customization through a WYSIWYG drag-and-drop interface. 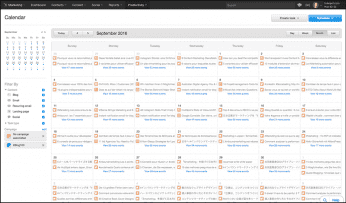 HubSpot’s Basic plan provides plenty of features for a general online marketing strategy – email marketing, blog analytics, SEO tools, mobile optimization and basic lead management tools – but the platform comes into its own on the Pro plan. That’s when you gain tools to tailor landing pages, calls to action and emails to your customers’ known tastes through smart content and A/B testing. You’ll also gain more lead management tools, notably custom lead scoring and prospect tracking; the latter in reference to when a sales lead revisits your site. The Pro plan also opens automation for lead nurturing – branching logic for highly personalized engagement with automation templates to save time on the back end. Companies that stand to gain the most from HubSpot Marketing would typically have a fairly low number of high-value customers. This keeps platform costs low while concentrating its customization and automation tools on a few targets. However, any company that considers the internet a ripe opportunity for lead generation (which it is) should consider HubSpot; known for its inbound marketing prowess, the company has a long history of knowing how to present content and ads the way visitors want to view them.